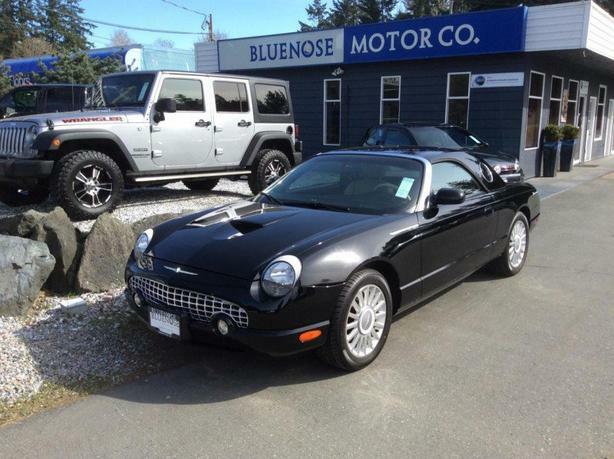 THIS VERY RARE EX US, NO ACCIDENTS WITH VERY LOW K' OF 21800 FORD THUNDERBIRD 50TH ANNIVERSARY PREMIUM JUST ARRIVED AT THE BLUENOSE MOTOR COMPANY. IN SHOWROOM CONDITION EQUIPPED WITH A 3.9 LITER V8 AND A FIVE SPEED AUTOMATIC TRANSMISSION. THIS IS A HARDTOP, SOFTTOP COMBINED THAT INCLUDES A STAND WITH COVER FOR THE HARDTOP. SOME OF THE FEATURES TO MENTION ARE BLUETOOTH, CLIMATE CONTROL, ALL LEATHER INTERIOR AND MUCH MORE. ALL TRADES ACCEPTED.